When it comes time to replace a roof, homeowners will likely be looking at several different products, and different roofing companies to perform the work. Often, a roofing contractor gives a quote which is much lower than anyone else. This is often a red flag; they may install an inferior material, surprise you with a sudden jump in charges, or simply do the work wrong. One way I see this happen is “cutting back on costs” by not removing the existing roof first – they install the new roof over the old one. 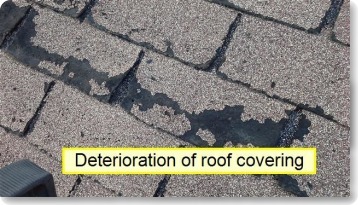 A ten-year old roof that was failing due to overheating. It works, but only for a short time. Double-layer roofs will look good and perform well at first, but often for only a short amount of time. The photo above is from a roof that was only ten years old – far too young to fail this badly. This roof should have lasted 15-20 years. The roof material overheats and fails. 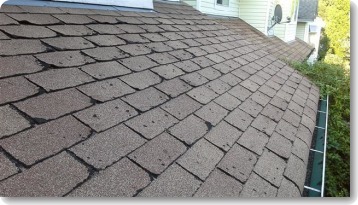 Due to the poor ventilation of the underside of the new shingles, the shingles overheat in warm weather and deteriorate. This also creates problems with the attic structure/sheathing, which may become damaged. This double-layered roof looks great now, but won’t last long. It often voids the warranty. Certain manufacturers prohibit double-layer installations, and will dishonor the warranty if a roof is incorrectly installed. Double-layer roofs cost more to replace. When the new roof inevitably fails, the roofers will need to remove twice as much material, meaning double the labour and double the disposal cost. 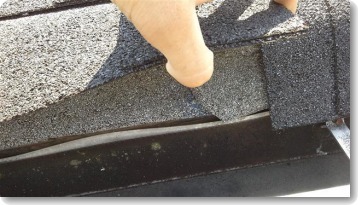 I strongly recommend against double-layer roofing – if you have a property that you think may have a problem roof, a professional home inspection is your best protection against unwanted surprises. 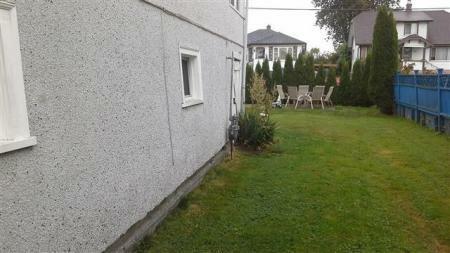 This week’s featured inspection is a Townhouse in Langley. The development was constructed in 2004, so it was just out of warranty. These townhomes usually feature a 2/5/10 warranty (2 years mechanical, 5 years envelope/leakage, and 10 years structure). The rear balconies were in poor condition, particularly for a young building. 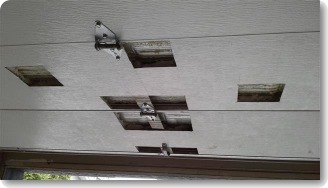 There was extensive rot and deterioration of the balcony railings and trim, and in several units the actual deck posts were damaged – a safety concern. 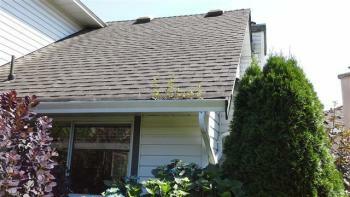 The roof was a typical, asphalt “laminate” shingle, which have a service life of about 20 years. Note how the downspouts are extended so they run down the roof, into the gutters, instead of directing water onto the shingles. 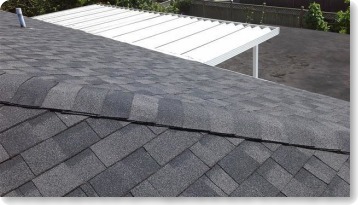 This will extend the roof life and is optional – the BC Building Code does not require these! I always point these out as a positive when I see them. These units are typically heated with electric baseboard heaters. 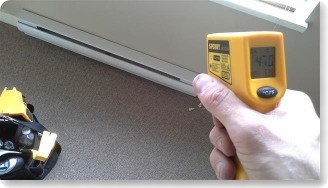 As part of our thorough Home Inspection, every baseboard heater is checked using an IR Thermometer. Electric baseboards provide reliable heat that rarely needs maintenance, which is perfect for a first-time home buyer. 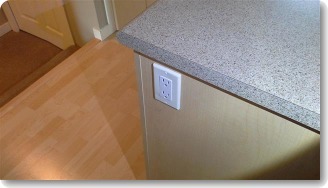 The kitchen island featured a receptacle on the side, however when tested, there was no power to it. A quick look inside the cabinet, and we can see that it’s a “dummy” receptacle which wasn’t even connected! The owner had started to install one (including drilling a hole through the floor for the wiring), and never finished. 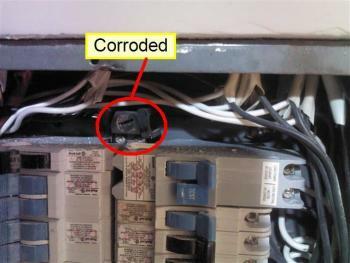 This is why we always check every receptacle when possible. (Note: The island was not installed permanently; it was free moving and could be slid around on the floor. Be careful to check if your island is secured before you buy). Finally, the garage door was completely hacked to pieces. The owner explained that they had cut it in order to fit a storage rack in the garage – a strange repair and one that I have never seen before. The only way to fix this is to replace the door. Outcome: The sellers negotiated a slight reduction on the price and will be moving in next month. In the lower mainland, there are thousands of homes within viewing distance (and directly beside) High-Voltage transmission lines and towers. 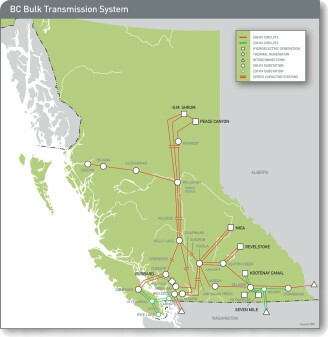 Such transmission arrangements are called “rights of way” (ROW) by BC Hydro. There are over 74,000 Kms of Power Lines in BC. Due to the great distances the electricity must be transmitted, a ROW will be between 69,000 to 500,000 Volts. At the high end, (250-500 Kilovolts), an audible buzzing and/or crackling sound may be noted. These voltages are obviously extremely dangerous and great care should be taken not to go anywhere near them. Power lines may sway as much as 4 meters vertically during windy/bad weather. 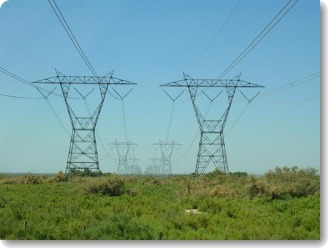 A fallen transmission line is disastrous, but luckily rarely occurs. If the home buyer is looking at a house directly beside a tower, this is a risk that they should take into consideration before purchasing the home. Homes, Buildings, and even foundations may not be constructed on a ROW, or within 10 meters of one. However, golf courses (such as one in Surrey), sheds, roads, fences, and parking can be constructed with permission from BC Hydro. EMF is a very real, physical field that is present around all electronic devices and the equipment powering them. EMF is everywhere electricity flows. However, some groups/individuals believe that EMF causes negative health effects in humans – most notably from Power Lines and “Smart Meters”, about which there has been much media coverage. There have been a number of studies performed, particularly one early study that linked childhood leukemia to EMF. Later, the National Cancer Institute (NCI) performed a study that failed to establish a link between elevated EMF levels and leukemia. Only several, long-term studies have been performed, and all have failed to establish a link between EMF and cancer. Another suggested health effect is Hormonal disruption – there is a large amount of anecdotal evidence of Hormone-related problems in people living near power lines, however as of this article’s writing we are not aware of any conclusive studies linking the two. EMF Radiation has been proven to drop dramatically over short distances, and is already present in areas without overhead power lines (such as near cell towers, microwaves, cell phones, TVs, etc). There is also (so far) no conclusive link between EMF and serious health issues. However, if you feel uncomfortable with power lines nearby you should investigate/research the issue carefully before proceeding. A quality home inspection is a thorough visual inspection of the major systems of the home, such as Roof, Exterior, Electrical, Heating, Insulation, and Plumbing. A home inspection will not include evaluation of EMF Radiation, and you should call a specialist if you have any concerns about the property. Have us perform your next Home Inspection! Call us today at 604 395-2795. 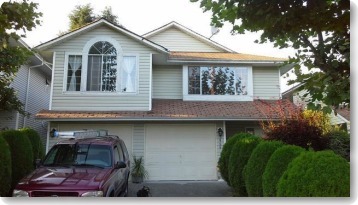 This week’s featured Home Inspection is a home in the Queensborough neighbourhood of New Westminster. A quick look at the front and one side of the home showed no real concern – a young (less than 5 years) roof and some newer windows. What causes movement like this? This part of New Westminster is situated on the Eastern tip of Lulu Island, which is also home to Richmond. The whole area is a flood plain, and the water table is extremely high. New Construction homes in this area are now built on pile foundations due to the poor soil conditions, however, due to the age of this home, it was a typical Slab on Grade foundation. Coupled with poor drainage and surface water management, and over time the home began to sink and lean. …The tile shower enclosure was badly damaged – here’s a moisture meter reading showing complete water saturation behind the tiles. 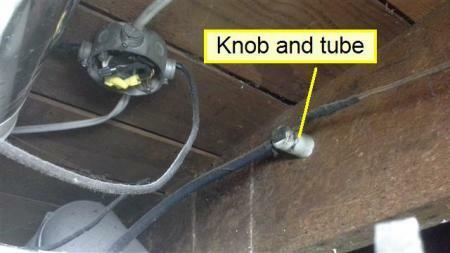 A ceramic knob and the associated wiring is visible in the above photo. 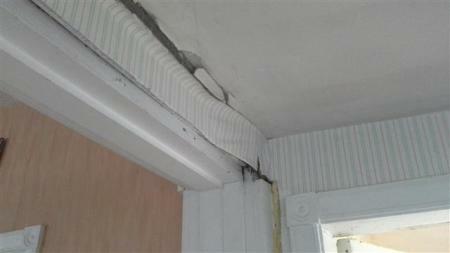 Coupled with the structural issues, this home requires some fairly major work. I recommended they contact a structural engineer, and an electrician to review the home. Safety is the top priority! What’s Included in a Condo Inspection in BC? Mark: Hi, it’s Mark Bossert from Top Local Lead Generation. We’re here talking about building inspection with David Fairbairn from Fairbairn Inspections in Vancouver. How’re you doing today David? David: I’m doing great Mark, how’re you doing? Mark: I’m good. As you can see I’ve got a little bit of sun this morning. I was doing some building inspection on my home, building repairs, I guess. So we’re talking about condo inspection today, so what’s the difference? What’s included in a condo inspection when you do it here in BC? David: So what we do with our Condo Inspection is very similar to a Home Inspection, Mark. We’re obviously we’re going to concentrate on seeing things that are going to be important to the person moving into the property. So one of those, you know, you’re going to test all the components of the house just like you would, you know like your heating system, your plumbing system, your bathrooms, your kitchen. One of the things that we do a little bit differently that not all home inspection companies do is test appliances and that’s with all our home inspections; testing the stove, the garburator, dishwasher, can even do the microwave oven. So these are the kind of thing we are looking at especially in a condo and we’re going to inspect the areas that surround the unit like for instance if you have a balcony, if you’ve got a roof top deck, any of these limited common areas. I’ve actually run into a couple of condos where there’s an attic. 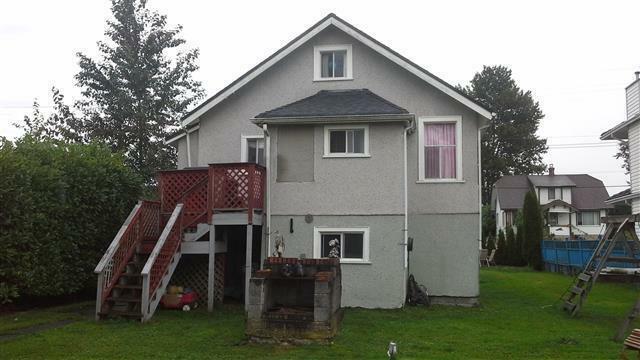 You don’t see it a lot, there’s actually a couple in Burnaby and they actually have full attic space that you can open up the attic and it runs all the way down the length of the condo and of course that’s part of the inspection. So everything that we can get our hands on, the more we can learn about the condo the better for you. Mark: So, do you like flush the toilet and run water into the tub and the sinks and those sorts of things? David: Absolutely, we test what we call functional drainage and functional flow, especially when you’re on the thirty-second floor of a high-rise building. We want to make sure your water pressure and your hot water is going to be available so when you move in there that first shower, you’re not calling me, cursing my name, so this is the kind of stuff that we want to make sure, we’re in the business of surprise mitigation. We want to make sure there’s no surprises when you move in. Mark: So, what about common areas like parking garages and outside drainage of the building, or the building envelope, those kinds of things, since we had all those leaky condos here in BC. David: Exactly, and our Condo Inspection includes all the common areas, so that’s your roof, parkade, your boiler room, your electrical vaults, your elevator room. Myself, I’m a Commercial Certified Inspector so I do commercial buildings inspections as well, I know what I’m looking at with these large buildings and if we can get access to those areas from the strata and not always, you know, sometimes they’ll say well o.k., we can’t let you in there right now or we can’t get you on the roof due to liability reasons, that’s fine, but if we can get access that we also have a look at it. I also like to go to the storage areas and the parking stalls to make sure there’s no moisture problems down there because that the thing you may not find out about until you’ve moved in. So, if you’ve got a, you know, a huge oil in your parkade and the strata’s going to assign you or you know, there’s a leak above your car, you know, it’s the kind of stuff we want to find out ahead of time. Mark: Yeah, so how about strata minutes and that sort of thing. Are you checking into those? David: Yeah, it’s part of the Condo Inspection, yeah, a free strata minute review. It’s just a, if you have an engineering report or a, you know, a depreciation report or anything like that and you may read through it and may have, maybe there’s a red flag in there and you don’t know what it means, you know, I speak English and I speak Strata so I can translate it for you and go through and help you out with that. Obviously you know, time permitting, you know, the sooner you can send it the better. I always prefer if you can send it ahead of the inspection but, absolutely, that’s something I do on a regular basis. Mark: So, I guess that’s where you might see things like depending on, like I mean there’s all sorts of, and types of strata like, we lived in a strata for a while where we had, they were like duplexes essentially and there were only twelve units or sixteen units in the complex but there was a budget and a time frame where we had to replace the roofs for all the sixteen units. David: That’s a big job. Mark: So that, but it’s in the strata minutes of well we’re in year ten and at year twenty we’re replacing all the roofs and here’s the budget number. So are you looking for those sorts of things as well as kind of ongoing maintenance or surprises? David: Yeah, exactly, yeah, I think you pretty much hit it on the head, you know a roof assessment, you know, you pretty much assume that in every building’s life, every twenty to twenty-five years there going to put a new roof on, so we want to know how old the roof is and if you just have your strata minutes, you know, there might be just a mention in there of o.k., you know what, you know, we had a leaky roof and that might kick off a roof replacement that you didn’t know that so, you know, so if you can get your hands on a depreciation report like you’re saying where it’s actually broken down by year, o.k. you know what, in 2018 we actually going to put a new roof on; let’s start saving now. That’s usually a good sign actually, that shows that you’ve got a proactive strata. But, if you’ve got reactive strata they’re going to panic in 2018 and put out a huge levy on everybody as they weren’t prepared, right? So, that’s the kind of stuff we’re looking at and the strata minutes usually supports where that’s going to turn up, you know, so obviously we’re going to do our visual inspection, but you want to go behind the scenes and find out what the problems are. Mark: So, what’s the best way to make sure I don’t buy a leaky condo? David: There’s two ways to do that, you’re going to, you know with every, even just looking around at different condos you’re going to want to enlist a trained person who knows what to look for, that’s a home inspector, realtor who has experience with that, and you’re going to want to get your strata minutes, and your engineering reports. These are the kind of things that are going to help you determine if there’s a leaky condo problem. So, get it inspected every single time, get an inspector who’s familiar with commercial building construction and who’s familiar with leaky condo and envelope issues who can maybe point out a, you know there might be a problem here, why don’t you go look at your strata minutes and depreciation report and have a look at it and see if there’s any talk of maybe you know, redoing one of the elevations and you know that can be pretty expensive. So that probably the best ways to surround yourself with people who are familiar with that type of building and to read your minutes, read all your strata minutes, every single line, everything you can get, you know sometimes it’s every two years, get more if you can, look through everything, you never know what’s hiding in there and it’s going to be a huge financial difference for you, possibly, right. Mark: So what would, like let’s talk about that. Maybe not everyone is familiar with the whole, cause it’s kind of died down a little bit, so what is, what’s the ramification if you buy a place that they suddenly they find that it’s leaky and what are we saying, what are we mean by leaky and then what are the ramifications, what could they be as big as, say, financially? David: Yeah, good question. I should elaborate on the leaky condo crisis. There was a problem that lasted from about 1982 to 1998 in Vancouver where we built buildings that leaked and they had huge, huge moisture problems. You know, a lot of them were designed similar to the buildings they had in California where there was a lot of, you know you had a lot of, interfaces, usually like a California style stucco, low rise, four story building with a, you know, a flat roof kind of looks like a cube with a bunch of stucco on the outside of it. Kind of risky buildings that, they get really spectacular failure, you know, they leaked, we had mold, they had structural rot in a lot of these buildings and we were looking at multi-million dollar repairs and it’s been a problem, only recently sort of tapered off around 2000 and prior to that, if you’re looking at a condo let’s say you want to look at a condo that’s built in 94, you know, in the Fairview Slopes area, that was a bad area; you definitely want to get a depreciation report, find out if there’s a rain screen installed which is the solution for a leaky condo and also call around. 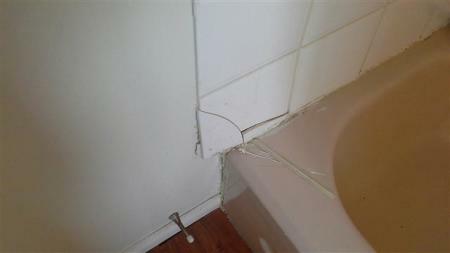 Call a home inspector, have the place inspected, ask a realtor, you know, these are the kinds of things that . . . . .
Mark: Awesome, and in some cases this was, that could be, you know, you can throw numbers like millions but it could have, in some cases it was two, three, four hundred thousand dollars per unit to get repaired. David: Yeah, I think the highest, the highest that I ever had direct experience with was a hundred and twenty thousand dollars per unit. In some cases in Port Moody there’s a building that they actually, the strata went bankrupt, they became insolvent and they actually, everybody just sort of left the building, they walked away from the mortgage. The bank bought it, did the work they needed to do and resold it, where they took it back. So, go to Google, we’ve got a great article on our blog, ‘How to Identify a Vancouver Leaky Condo’ and there’s a lot of good information if you go to Fairbairn Inspections.com. There’s a blog post on there that’s going to show you exactly, you know, what a rain screen looks like, why you need one and you know, if you educate yourself a little bit you’ll be able to walk down a street and actually go hey o.k. maybe that one’s got a rain screen and maybe that one still needs it and you know, if you can educate yourself on this issue, especially type condos in the Vancouver area in that time period, you know, you could dodge bullets, so . . . give me a call anytime. My number, I think I forgot to put that number but you can go to our website, email or phone number and give me a call. Happy to help you out. Mark: So, we’ve been talking about condos and what’s included in a Condo Inspection in Vancouver, BC with David Fairbairn from Fairbairn Inspections.com. You can reach him at 604-395-2795. Next time he’ll turn his little ghost machine on so he has his number on there. Thanks a lot David. David: Thanks Mark, talk to you later. We inspected this Mobile Home in the Fleetwood Area of Surrey recently. Mobile/Manufactured Homes are interesting to inspect – the foundations, electrical and roofing systems are completely different than a site-built home. The unit was a small single-wide, approximately 70 ft long and clad with a metal exterior, and a metal roof. The trailer featured some newer vinyl windows – a nice upgrade from the original aluminium windows. There were a few concerns at the exterior, particularly this exposed corner that was allowing water to enter the wall cavity from above. Flashing should be added right away to prevent further deterioration. A covered porch / workshop had been built off the side, which was starting to deteriorate and we deemed it unsafe until the rotten framing was replaced. 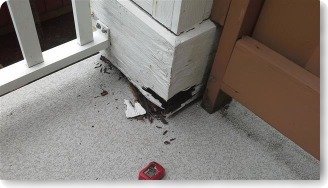 The porch felt spongy when stepped on – investigation below revealed several wood posts that were rotting and needed replacement. 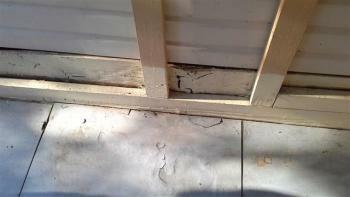 The porch was also poorly constructed, using 2×4″ wood joists which were bowing due to lack of support. Manufactured Homes require specialized furnaces that are rated for manufactured buildings. This furnace featured a stamp authorizing it for use in this setting. 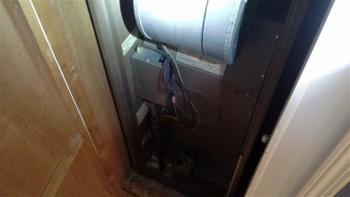 The furnace was a 1983 Intertherm that was clean and operating well. 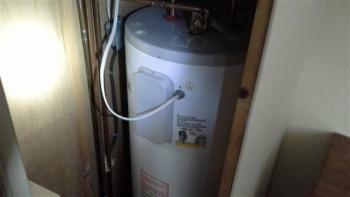 The electric hot water tank was located in the bedroom closet. At 13 years old (and starting to corrode), it had reached the end of its expected service life. These tanks typically last 8-12 years, and the GE-brand tanks tend to fail earlier due to their poor quality control. This will cost about $800 to replace. Overall, the home was in fair condition, and the buyers negotiated to have the hot water tank replaced and the deck repair paid for- about $3000 in savings. We inspected this home in Port Moody, BC recently. It was a 30 year-old home with a split crawlspace / basement configuration. The lot was sloped considerably, and a prior rain (the day before) provided ideal conditions for a Home Inspection. Entering the crawlspace, there was considerable water damage and rot to the floor structure, below the base of the chimney. Everyone (including some contractors) initially suspected poor lot grading to be the cause, however, a close look at the area (and water testing) showed no water pooling issues in the area. The repairs were completed by Ken Hunter from HunterStruct, an experienced general contractor who specializes in structural repairs. The buyers were thrilled to have the work completed prior to their possession date, and recently moved in. We inspected this property in Vancouver, which was built in 1943. Most of the home was in “original” condition, and many of the components (wiring, insulation, plumbing) were original and in need of a lot of work. In the basement, we can see an interior sump, which were popular until about the early 70’s. The sump pit is a receptacle for rain and surface “storm” water, and is designed to overflow into the city storm drain. However, the problem with interior sumps is obvious – directing water into the basement puts the home at risk for flooding. Right away we can see that there is a moisture problem in this area, as the owner has placed a dessicant container next to it. This downspout tied into the perimeter drains. 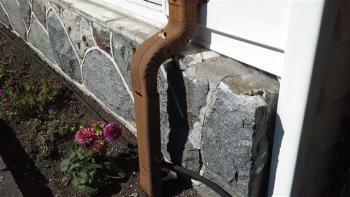 Homes built after 1986 in the lower mainland typically use a 2-pipe system, however this was a single-pipe system. Inspecting the exterior, the original terra cotta perimeter drains were noted, and I recommended having a drain line scan performed. 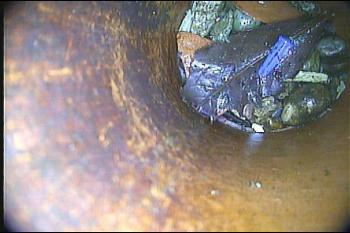 A plumber can insert a camera through the lines and determine if there are any blockages or breakage. Old terra cotta lines, while resistant to root damage, can crack or crumble below grade. The plumbers scanned from three locations, including the drain at the bottom of this stairwell. 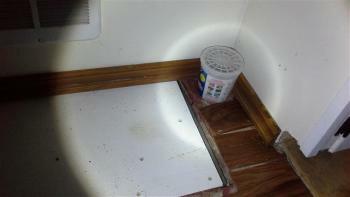 Flooding of the stairwell was evident (not in the photo) due to a large amount of wood rot at the base of the door. 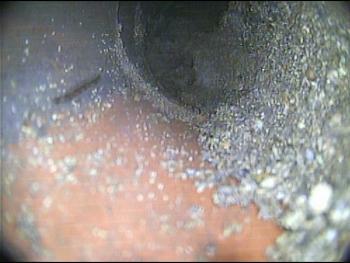 Here’s a photo from the drain camera – we can see some debris but the line is mostly clear. However, there were some issues. 1. The interior sump piping entry points were extremely high (only 4″ below top of pit), so there was almost no “buffer” should the lateral back up. The drain in this area (below the deck) was completely blocked off – whether this was intentional or a result of construction work was unclear. In any case, it will not function and required expensive excavation and drainage work. The plumber quoted from $10,000 – 18,000 to repair the issue, and the buyer saved a significant amount of money off the purchase price of the home. If you’re buying an older property, I recommend having the drains scanned. 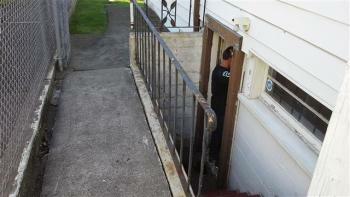 And, of course, getting a high-quality Home Inspection performed by us. It pays! 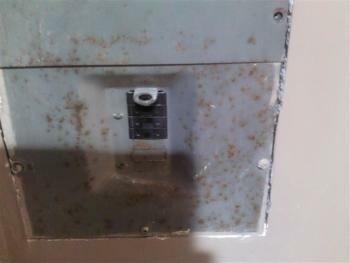 The sub-panel was badly corroded and had no identifying stickers or information. We can see (photo below) that it was probably salvaged from another building where is was exposed to water. 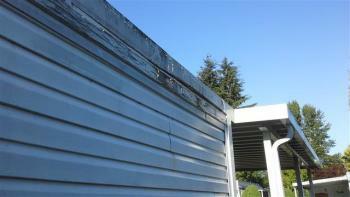 Corroded or water-damaged panels are always a safety hazard, as rusted metal can overhead or arc, causing a fire. Next, we see a corroded lug. A quick surface temperature measurement showed it was overheating. A double tap is an illegal repair whereupon two conductors (wires) share the same breaker. It’s usually done when there are no spare locations to add another breaker. The problem? The breaker is only designed to carry one wire. If you add a second wire the connection becomes loose and the wires make poor contact. The result is overheating, and the breaker may also not perform properly. (Tripping early or late). Below we see the real double-tap at the red arrow. Fixing a double-tap is easy – but in this case replacing the sub panel with a larger one was the best option. 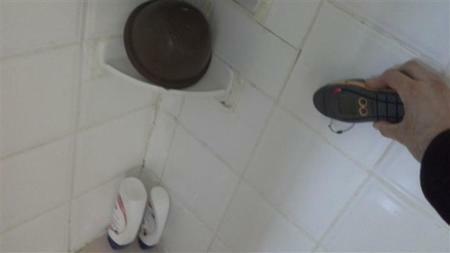 The buyers purchased the property and the electrical safety upgrades are currently under way. A Grow Op Can Destroy a Home’s Electrical and Structure. Marijuana grow op (MGOs) are common in the BC lower mainland, however this crime has diminished in popularity lately (most occurred in the 1990’s). They are incredibly destructive – a home may be filled with mold and hazardous wiring. If you’re buying a property in BC, this is must-read information… buying into a grow op home could spell financial disaster. 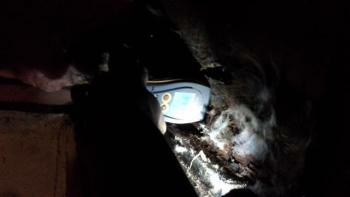 There may be circular cut marks between rooms, or in the floors above crawlspaces. 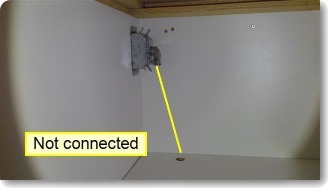 Grow lights are hung from above, so look for patterns of small nail/screw repairs in ceilings. Look for circular patterns on floors – pots often leave a ring-like stain. The floor may have been painted to cover up the stains. 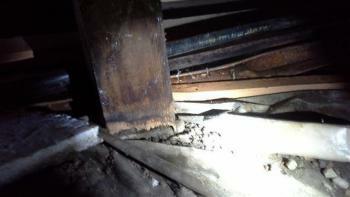 If the grow op took place in the crawlspace, check the bottom of the joists for nail holes. Check for fresh paint around windows where sills may have been damaged. A great trick: Take a flashlight and lay it sideways on a wall or ceiling – this casts a shadow on any imperfections and allows you to see past repairs. I have used this technique in thousands of homes and it works very well for seeing the wall’s history. Growing plants indoors requires a huge amount of power – and the operators don’t want anyone to notice. 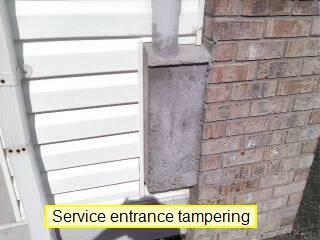 Look for evidence of tampering next to the electrical meter. 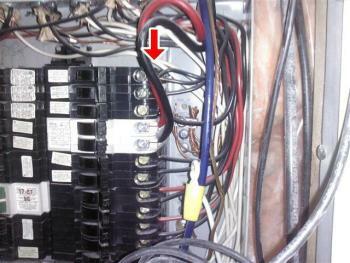 Also look for high-amperage breakers (in the main panel) that don’t appear to have a purpose. If you see several 40-amp breakers, and there’s only one kitchen in the home, be careful. Look for evidence of tampering with fireplaces – these provide an excellent exhaust option and are often rusty, damaged or have broken glass or missing fire logs. 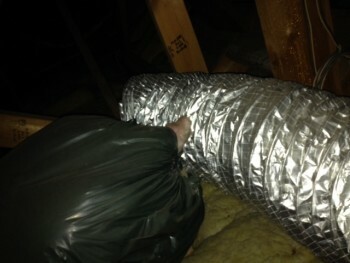 There may be tuck-tape or duct-tape around the flue. In some renovated grow-ops the fireplaces have been completely drywalled over to hide the damage. Look for staining and signs of moisture in the attic. 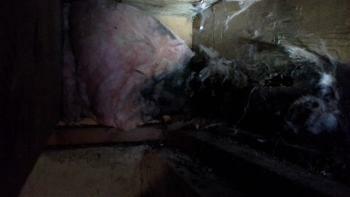 Attics usually suffer badly – black mold and, in many cases, rotting wood, can be found. 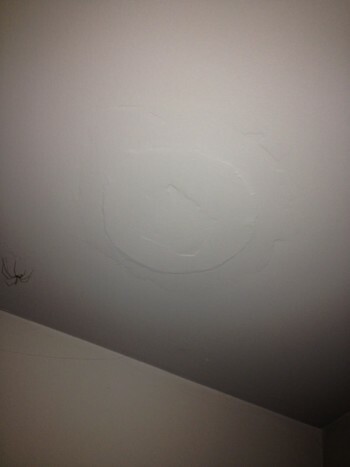 If an attic has been remediated (mold removed professionally by a contractor), there are usually still signs visible. 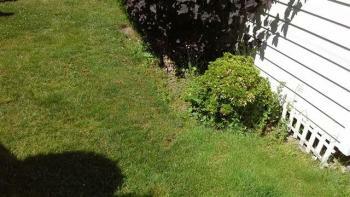 Remediation usually leaves a white or green residue that is easily seen. Extreme mold will show up as branch-like marks, even on the trusses. Thin, winding patterns on 2x4s and plywood indicate extreme moisture conditions. 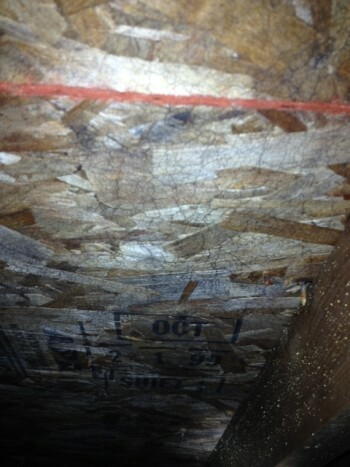 In a particularly bad ex grow op the plywood or OSB sheathing may have been damaged to the point of collapse. 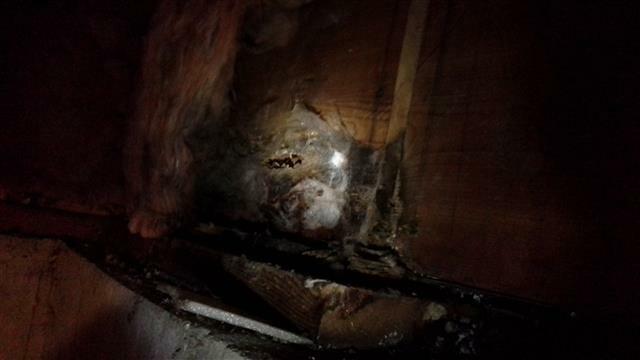 In one building we inspected in East Vancouver, there were mushrooms growing out of the remnants of the attic sheathing! Check the attic and roof for added ventilation. A few roof vents or a turbine vent is normal; six turbine vents is not. 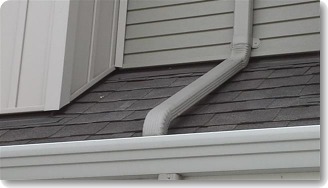 Also, check for staining around the exterior soffits. In many grow homes there is rust-colored staining on the soffits due to the metal in the roofing nails “bleeding” through the eaves. As part of our home inspections we check the soffits carefully. 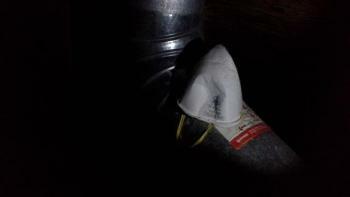 Ventilation issues and condensation can usually be predicted before even entering the attic area. Look for electrical tape, ducting, masks, gloves, loose wiring and bags of insulation, particularly in the attic and crawlspace. Several times, we have found trash bags full of ducting and soil still in the garage. Criminals can be just like the rest of us – forgetful! Grow-Operations were originally more likely to be on dead-end streets, cul-de-sacs, and forested areas with a lot of privacy. However, newer operations can occur anywhere, even in condos and townhomes with close neighbours. Check the front door for signs of forced entry – the police may have broken down the door to get in. Look for unusually high amounts of security such as bars on windows, security cameras and triple-locked doors. But what about the seller’s PDS (Property Disclosure Form)? Doesn’t it require owners to disclose the existence of a past grow op? The owner may be deceptive. The owner may not be aware of the issue. The form wording may be a loophole – many forms ask the seller if they are “aware” which may be open to interpretation. They are difficult to enforce in court. If you need to sue, it may be impossible to prove that a seller was actually aware of an issue. Have a quality, professional home inspection performed, every time you purchase a home. Your professional inspector is trained in finding problems, and can save you from potentially expensive mistakes. While an inspection can’t guarantee an MGO will be uncovered, and most SOPs (Standards of Practice) do not require reporting mold conditions, the inspector may notice signs of faulty wiring or unsafe tampering with heating equipment, for example. 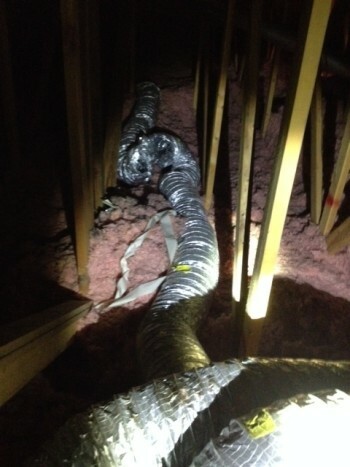 Added more information on attic remediation residue, as well as information on drywall side-lighting tricks. Added detail to smaller sections.